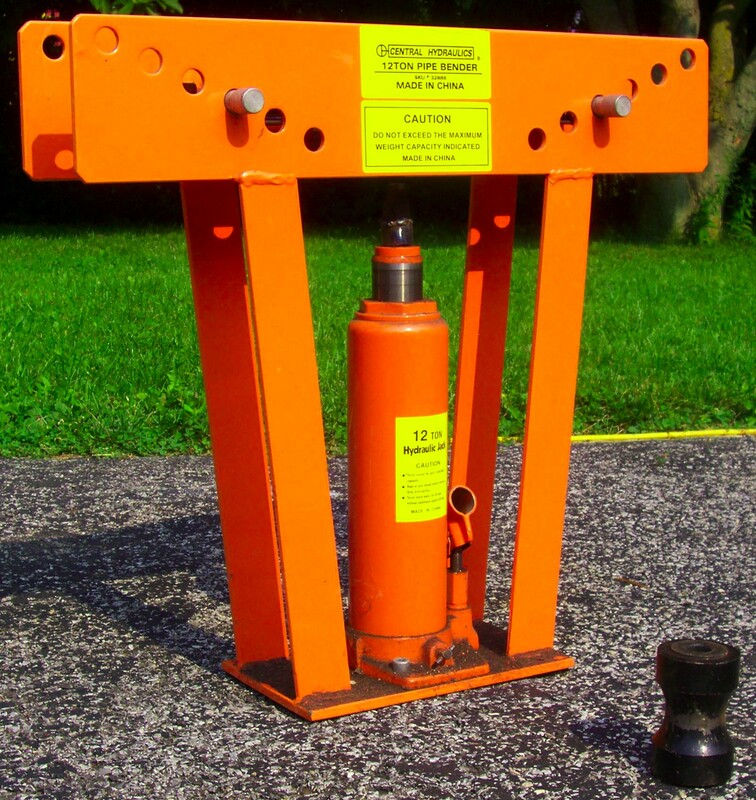 Scrap concrete reinforcing bar ("rebar") can be used as a temporary earth anchor. This use is popular at the desert camping art event called Burning Man. Two drawbacks of rebar for this use is that it is straight (offering anchoring only within a narrow angular range perpendicular to the direction the bar is driven) and the top is a dangerous potential hazard as the protruding end is sharp, small, and hard-to-see. By bending the protruding few inches at an angle of 90 degrees or less, both these problems can be solved. However, to permit it to be hammered into the ground, the bend must be very tight or else the impact of the hammer will simply further bend the bar. 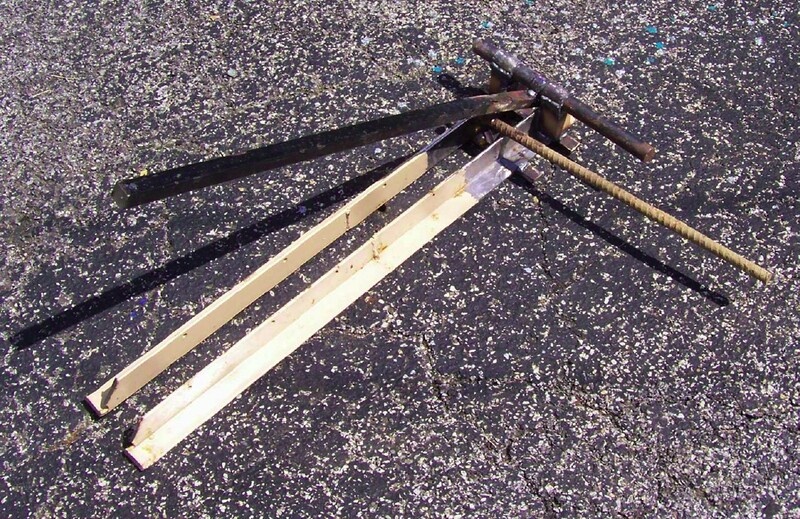 So, in August, 2009, I developed a Rebar Kinking Tool. It is designed to kink protruding few inches of the rebar at an angle of 90° or more to better contain anchoring ropes and to reduce the risk of injury from stepping on it. 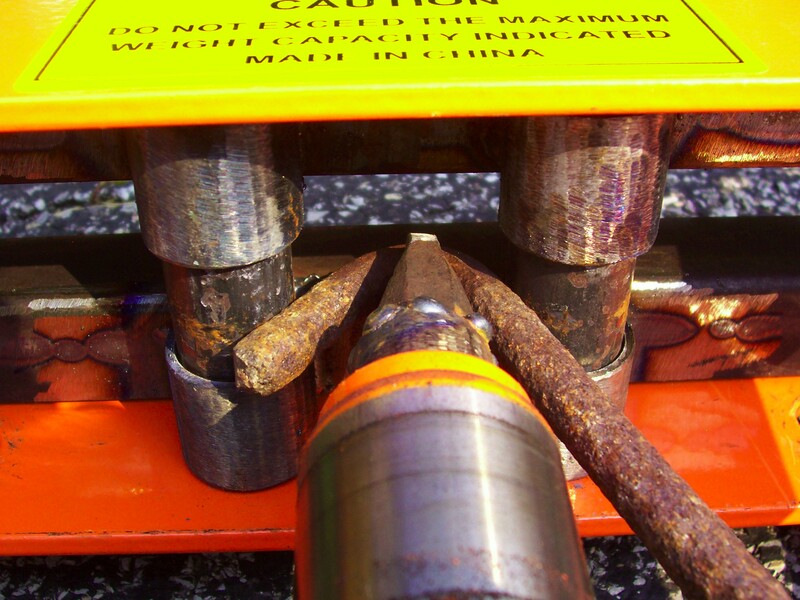 In point of fact, rebar is too brittle to bend at a sharp angle without heating it, but the tool works admirably on softer bars up to 1/2" diameter. Check out the blog entries for this project for anything new. In the first version, I welded two bedrame angle-steel rails together and put a groove for the bent rebar to sit. The lever has a wedge on the inside edge that's more clear in the detail image. There's about 4 inches from the pivot to the wedge, and the rails are set about 2 inches apart. 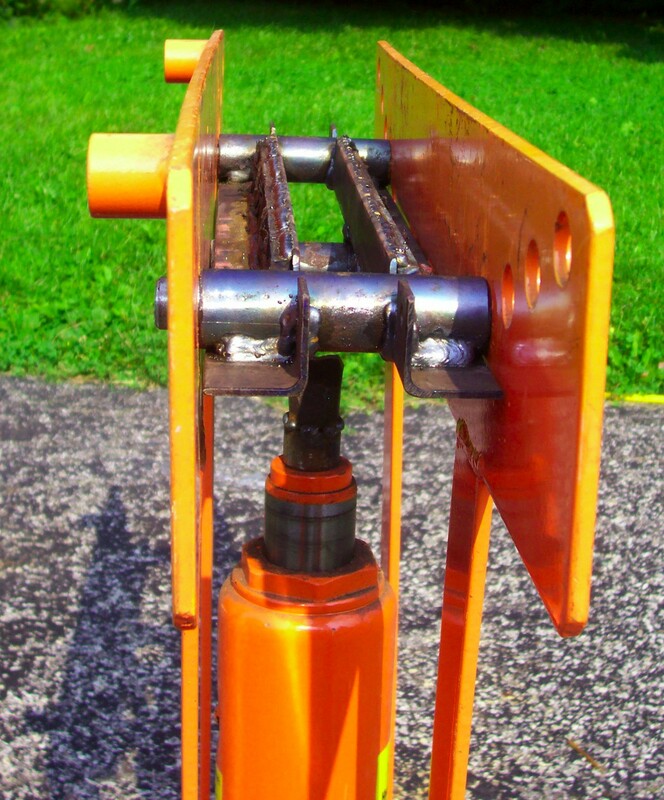 The lever is a solid steel 1"-square rod from a wrought-iron fence. Since it's about 32 inches long, the mechanical advantage is about 8:1. The pivot is a couple pieces of water pipe with a solid 1" rod as an axle. When I tried my first piece of rebar, though, the rebar didn't budge. At all. I put my whole weight on it and even bounced on the bar, bending it pretty easily. Admittedly, the dynamic force was probably close to 250 pounds, so it's not surprising the rod bent. 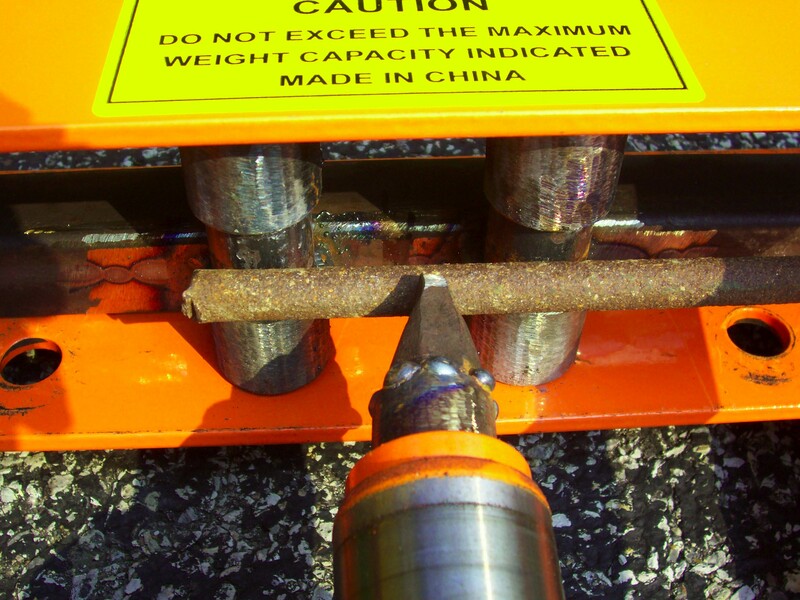 That means, though, that I was applying some 2,000 pounds of force to the rebar — with a 0.125-square-inch surface area, the rebar was receiving about 16,000 psi … it got a dent in it, but it refused to bend. I decided that what I needed was more power. Not because that's my only answer, but because it was apparent that to bend the rebar as tightly as I was hoping to do, I would actually need to apply a lot more force. What I had on hand was a hydraulic pipe bender with a 12-ton capacity. I built an adapter that seats the wedge on the head of the hydraulic cylinder, and I built an adapter that set the anvil at the right location by using the bender's existing pins for the factory anvils. 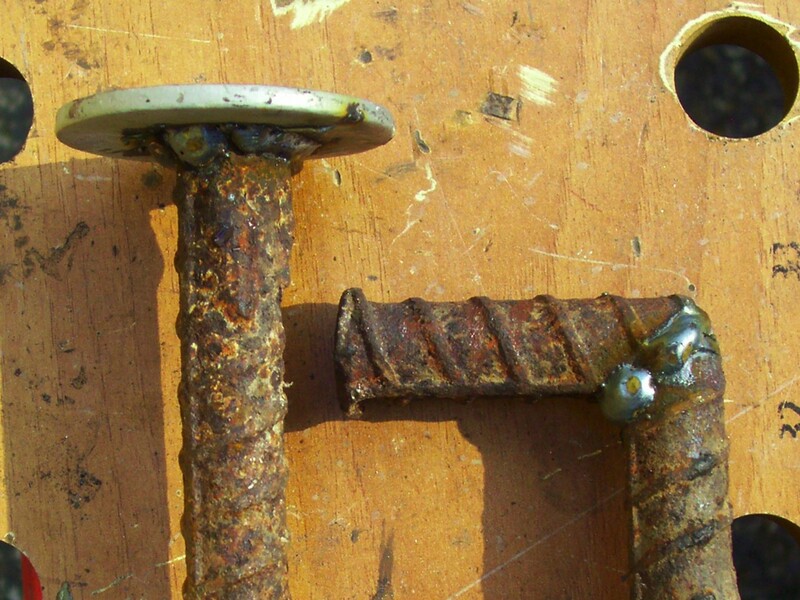 I also took Jolly Roger's advice and used rollers so that as the rebar would bend, it would be able to be pressed into the gap between with little resistance from friction. It all works quite simple: you put your workpiece in the machine, then pump the cylinder and bend it. I started by bending some 1/2" rod I had around that I had been using as anchors and that worked great, yielding a nice tight bend that is easy to hammer. The rebar, however, was too brittle and it ended up snapping. 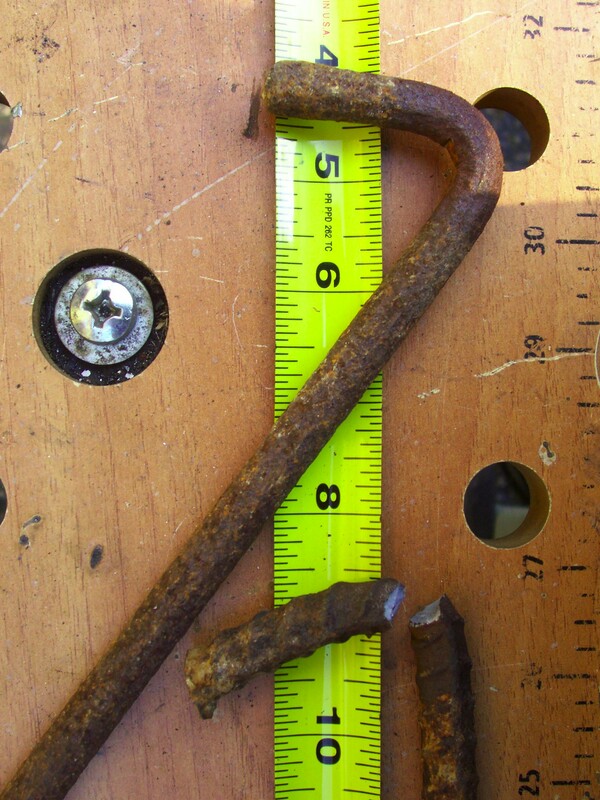 Also, if you look close at some of the pictures, you can see that I welded a reinforcing bar on the angle-iron rails. When I started doing my first test, I noticed the rails were bending quite a bit. The amount of bend should not have been noticeable, and it should not have increased as I went on. The addition of more metal made it much stiffer. To bend rebar, one option would be to heat it, but I don't have a torch handy that can deliver enough energy. As such, I decided to work out a couple alternatives. One was to cut the rebar at a 45° angle and weld it back together after rotating it so I end up with a 90° bend in it. It looks okay but the cutting tools I have (a 7-1/4" circular saw with a metal cutting blade) has to work awfully hard to make it work. I also happened to have a bunch of washers lying around from the trailer hitch ball — to get the ball to mount, I had to stack a bunch of washers and I bought more than I needed just in case. The spare washers welded easily onto the end of the rebar. I'm not too confident in the welded solutions because I think the welded rebar is even more brittle than ever. I'm hoping it'll be fine, but at least I have a bunch of rods bent nicely. Found this product iron rod benders here KB Rod Benders (kbrodbenders.com). Check out the uniquely made product.